Mobility aids are for people who find it difficult to move either because of their age or medical conditions. There are different types of mobility aids to help patients improve their body balance and move around easily. Canes and crutches are basic walking aids that make walking easier. You use your upper body to carry your body weight, which improves balance and makes walking easier. Canes and crutches are useful for people with balance issues, injuries and permanent disabilities. 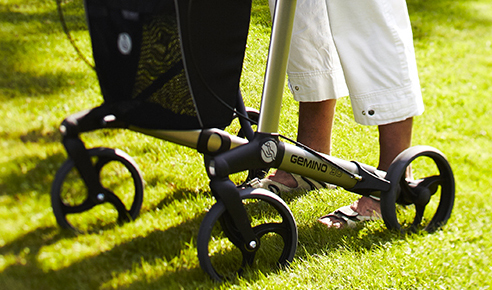 If you are looking for more ease of movement, grip and comfort, walkers are the best. Walkers boast features like adjustable handles, lockable brakes, foldable body and rest seats, to make walking extremely easy for you. There are different types of walkers. Choose one that makes walking easy without demanding a lot of effort from you. If you are in search of high-quality walking aids and mobility aids in the North East, visit Mobility Direct North in Newcastle upon Tyne. We have an array of walking aids to match your mobility needs including tri-wheel walkers, rollators, and transit chairs. Wheelchairs are for people who cannot walk. A wheelchair makes the task of moving around easy. Choose from manual and automatic models. Modern wheelchairs allow you to travel even longer distances. At Mobility Direct North, we offer a wide range of wheelchairs including self-propellers, lightweight wheelchairs, electric wheelchairs and foldable wheelchairs. Our wheelchairs offer excellent body support and comfort and boast features like padded upholstery, adjustable backrest and puncture-proof tyres. Mobility scooters are for those who don’t have the strength in the upper body to use a wheelchair. These aids are ideal if you are looking for an equipment that enables you to move easily, freely and without putting much effort. Modern mobility scooters are well-designed and very practical. You can use them indoors, outdoors, and even carry them with you on extended trips. Mobility scooters are easy to operate and use. What’s more, their safety features prevent the risk of accidents. Road scooters are permitted by law for use on the roads. These vehicles feature lights, indicators and other safety components for legal compliance. You don’t need a license to ride a mobility scooter on the roads. Mobility Direct North offers mobility scooters for every need including road scooters, pavement scooters and boot scooters. Be sure to visit Mobility Direct North for the best and the most affordable mobility aids in the North East. We also offer a range of other independent living aids. We offer a no-obligation, free demonstration of our products. Call us today at 0191 285 4245 to schedule a free demo.